We help you sharpen your message, reach the right audience and join everything together with integrated software and detailed analytics. Our inbound strategy helps you build trusted relationships with potential clients with content that is too good to ignore. We use HubSpot software to integrate your website, email, social media, lead capture and CRM. 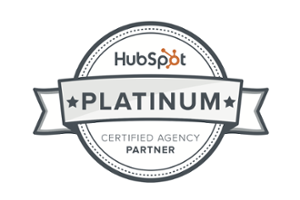 In fact, we're a HubSpot Platinum Certified Agency Partner. It's kind of a big deal. Engage earlier in the buying cycle. Reach top decision-makers. Build trust and confidence. We help you communicate the key benefits of your products and services consistently across all channels. Typically, we produce carefully-structured propositions, descriptions, headlines, and reusable copy blocks. This helps you tell your story in a consistent, powerful way. Coordinate all your content creation, publishing, inbound marketing and, social media activity to achieve the greatest impact. Our team works with you to plan a rolling content calendar that integrates all your online marketing activity and synchronises to other events and plans in your business. If you try to talk to everyone, you'll end up reaching no-one. Segmentation and targeting are the essence of marketing, and personas help you do it. Buyer personas are a semi-fictional, ideal representation of your target customer that brings their needs, goals and pain points into sharp focus. We combine desk research, interviews and analyst insight to produce clearly-defined audience personas so you know exactly who you are talking to. We help you find your voice and apply it consistently across all your communication channels. Personas help you define who you want to talk to and proposition development helps you figure out exactly what you want to say; but your tone of voice describes how you say it. It's the beating heart of your marketing strategy: stand out from the usual corporate blah-blah and make your point consistently across all your channels. Is your current B2B marketing strategy delivering the results you need? If you'd like an objective, expert review, get in touch and we'll take a look.